“Normally, suing police for failing to prevent crime is not allowed by courts. But a three-judge panel of the Ninth Circuit Court of Appeals has just allowed a lawsuit against the City of San Jose and its police department to proceed, despite this general presumption (called “qualified immunity”) that police cannot be held responsible for failing to prevent crime. News media, both local and national, watched and recorded as San Jose police stood aside as people leaving a Trump rally in San Jose were heinously assaulted by anti-Trump thugs. 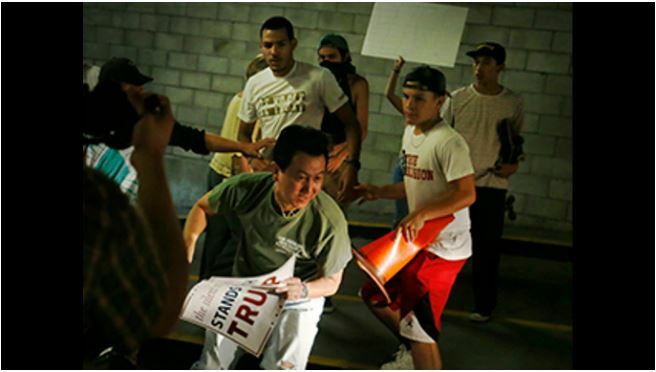 “Protests outside a Donald Trump rally in downtown San Jose spun out of control Thursday night when some demonstrators attacked the candidate’s supporters. “If the allegations are true, “the officers acted with deliberate indifference to a known and obvious danger“ and violated the Trump supporters’ constitutional rights,” said the Ninth U.S. Circuit Court of Appeals in San Francisco. After the rally at the McEnery Convention Center, police directed those in attendance to leave from a single exit. They funneled the Trump-supporters into a space dominated by hostile demonstrators who already had been violent. In my opinion, this constitutes collaboration in the violence. The lawyer for the plaintiffs is Harmeet Dhillon, a hero of mine. In addition to being the Republican national committeeman from California, she represents James Damore in his lawsuit against Google for firing him over critical views expressed about diversity. She richly deserves a large contingency fee if these lawsuits succeed and result in substantial judgments against wealthy defendants who discriminate on the basis of political preferences. “Two undercover police officers at a Donald Trump rally last week said they saw Trump supporters “get punched, kicked and pushed” and “running for their lives,” according to a police report. The officers’ observations were included in the arrest report of Antonio Moses Fernandez, 19, of San Jose, who is accused of throwing a metal barrier into a police skirmish line following the Trump rally June 2 outside the San Jose Convention Center. Fernandez made his first court appearance Tuesday and was charged with felony assault on a peace officer with a deadly weapon and misdemeanor resisting, delaying or obstructing an officer, according to court documents…. “When there’s an assault on a police officer, we don’t have any tolerance for that,” prosecutor Chris Boscia said. So far Fernandez is the only person to be criminally charged stemming from the violence that erupted outside Trump’s rally last week. Three other people were also arrested the day of the rally, including Ahmed Abdirahman, 19, of Santa Clara, and Robert Trillo, 18, both on suspicion of felony assault with a deadly weapon, and Michael Kitaigorodsky, 19, of San Jose, on suspicion of refusal to disperse. Three juveniles were also arrested, police said Wednesday. A 16-year-old and a 17-year-old, both of San Jose, were arrested for felony assault with a deadly weapon. A 16-year-old Milpitas resident was arrested for misdemeanor battery. Their names were not released because they are minors. The attacks were seen in television reports…. One of the undercover officers wrote that he was “monitoring protesters from within the crowd” and estimated there were 250 protesters gathered behind barricades at 6 p.m., about one hour before Trump’s scheduled arrival. That number grew as the evening wore on. As the crowd grew, the officer noted that “it became inherently dangerous for anyone wearing a T-shirt or hat in support of Trump. I observed Trump supporters being spit on, objects being thrown at them, punched, kicked and even robbed of their personal belongings. Just after 8 p.m. police issued an order for the crown to disperse. At 9:10 p.m. the undercover officers witnessed Fernandez throw a metal barricade into officers dressed in full riot gear. One officer was injured after being hit by the barricade, according to the report. The undercover officers say they witnessed Fernandez pick up a second barrier and then put it down. One witnessed Fernandez remove his shirt and use it to cover his face. One of the undercover officers eventually tackled Fernandez and held him down until uniformed officers arrived to make the arrest. During a police interview, Fernandez denied throwing the barrier into the police line. In the face of critics who charge police did little to protect Trump supporters, Police Chief Eddie Garcia has defended his officers’ handling of the protest. Garcia insisted that it was more important for police to hold their “skirmish line” formations than to stop individual attacks. “We are not an ‘occupying force’ and cannot reflect the chaotic tactics of the protesters,” Garcia told reporters. Unless a victim’s life was in peril or the violence was “spiraling out of control,” he said, officers held back to avoid inciting more violence and having the crowd turn on officers. He also said the 250 police weren’t enough to control about 400 protesters. Following the rally several videos appeared on various social media sites and captured some of the attacks. A police task force is reviewing video evidence of the assaults and other possible crimes from the protest. Monday the police department announced more arrests were “imminent,” but so far no additional arrests have been announced.